Vinegar powder is used to add tartness and flavor to seasonings, rubs, marinades, barbecue sauces, salad dressings, and dry mixes. Mix with salt to make a seasoning for French fries, homemade potato chips, roasted potatoes, and even steamed veggies. With these variety packs, you'll have the right vinegar for any dish, at your convenience. 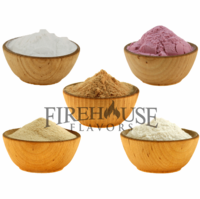 Save 5% to 15% when ordering the sampler versus ordering each vinegar powder individually.